This spiral stair is an example of Stairways, Inc.'s standard fully assembled spiral installed without a landing. It's a 52" diameter spiral staircase with 27 degree treads. This stair has no landing but has a mounting plate at the finished floor at the top. This spiral stair is easy to install; installation can be done by two men in a few hours. 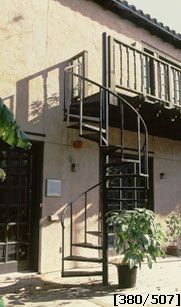 The spiral stair handrail is # 200 steel (1 1/2" round tubing); balusters are # 302 (1" square tubing); treads are smooth 12 gauge steel; the center column is 4" OD .135 wall round pipe tube; and the finish is Stairways, Inc.'s standard semi-gloss black paint. The only spiral staircase application not requiring a landing is an installation on an outside corner. When ordering a spiral stair without a landing, special care should be taken to determine that there will be sufficient headroom. Generally, if code will need to be met, a landing by Stairways, Inc. will be required.